Put the milk into a saucepan with the carrot, onion, peppercorns, parsley and thyme. Bring to the boil and simmer for 4-5 minutes and then stand for 10 minutes. Remove the vegetables and bring back to the boil, adding the roux to thicken the sauce. Roux is a thickening agent for soups and sauces. Made by cooking a flour and oil paste until the raw flavor of the flour cooks out and the roux has achieved the desired color, a properly cooked roux imparts silky-smooth body and a nutty flavor while thickening soups and sauces. Sweat the mushrooms and onion in a saucepan until soft but not coloured. Add the Béchamel sauce and stock, and season with salt, pepper and garlic. Use a hand blender to liquidize the mixture and dilute further if necessary. Bring the soup back to the boil and season with salt and pepper if required. 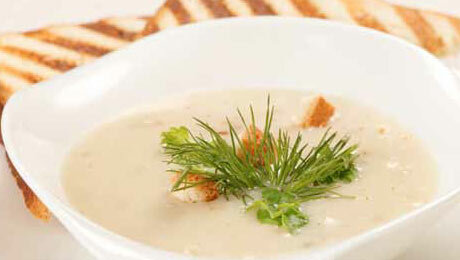 Serve with some brown bread and garnish with a little cream and fresh parsley.